Numerous micro lending institutions are available in the market and provide simple access to short term personal loans. With a quick and easy application process, Ayoba Loans strives to provide affordable loans for all South Africans. You can simply apply online, so minimal paperwork is required. Ayoba Loans is a leading micro lending institution that offers fast, flexible solutions designed to give you access to the money you need. 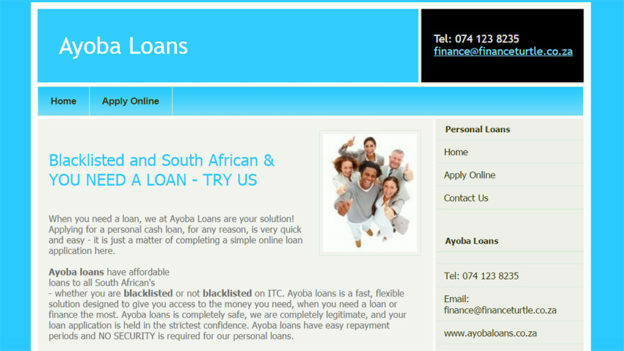 If you have been blacklisted or have bad credit, you can be assisted by Ayoba Loans. As a registered credit provider, Ayoba Loans provides finance to individuals who can afford to repay the loan comfortably. Every application is processed quickly and in complete confidence. The loans are unsecured, so you don’t have to worry about putting up any assets as collateral. Once you’ve been approved for a loan, you can expect to get cash in your account within 48 hours. The service is available entirely online. You are under no obligation to accept the offer provided to you, but you can choose a loan option that suits your financial needs. Interest rates charged are dependent on you individual credit history. One of the benefits of choosing a lender like Ayoba Loans is the flexibility. There are no limits on how you can use your loan. Use it to pay for an emergency medical bill, to cover rent for the month or to pay for your child’s school fees. Pay-outs are quick and efficient, so you won’t have to wait for days or weeks on end to access your cash.